Approximately 244 million people around the world are international migrants, and 50% of them are women. About 14 million are refugees seeking relief from persecution and protected by the international refugee law system. Many other migrants, including those seeking relief from conflict, poverty and disasters are the least protected by the international legal system. As people cross borders – becoming migrants – they often leave behind physical danger only to be confronted with physical and legal vulnerability. 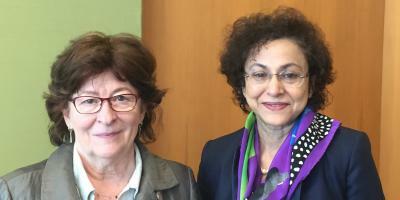 IDLO's Director-General Irene Khan met the United Nations' Special Representative of the Secretary-General for International Migration, Louise Arbour, in New York last week to discuss follow-up to the New York Declaration for Refugees and Migrants. Ms Khan recently contributed to The Bologna Institute's Migration Series, providing greater context to how human rights, the rule of law and sustainable development can make a difference in the international migration crisis - listen to Podcast.